NEW DELHI, Aug 7 2012 (IPS) - Mr. Jayakumar (73), a philanthropic bachelor hailing from a prosperous industrial family in the southern Indian state of Karnataka, decided at the age of 70 that it was time to settle down. He began to search for an old age home where he could retire without giving up the things he enjoyed most – reading spiritual and philosophical books and going for long walks. He found just what he was looking for at Panchvati, a residential care home located in the busy centre of south Delhi, designed especially for senior citizens like himself. But in a country where the ageing population is growing rapidly, senior citizens like Jayakumar are part of a tiny, privileged minority that can afford the comfort and security of quality retirement homes. 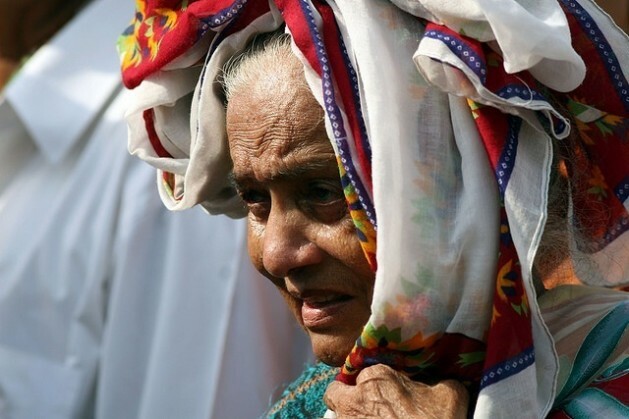 According to the 2011 census, ten percent of India’s population of 1.2 billion people is over 60 years of age. These 100 million elderly are almost completely politically disenfranchised and increasingly reliant on paltry state services and far-flung families for economic, social and physical support. Most elderly Indians are forced to make do with sub-standard residences that offer neither personal care nor the comforting environment of a home away from home. Retired government employees earn pensions between the range of 8,000 and 50,000 rupees (144-896 dollars) per month. With old age homes costing between 5,000 and 20,000 rupees (89-358 dollars) monthly, it is clear that few can afford professional care in their old age. In fact, government statistics indicate that only three percent of those seeking institutional care actually manage to secure a place in any of these homes. Mortality rates in India increased from 60-65 years throughout the decade of the 1980s, and from 90-95 years in the 2000s, Avenash Datta, country head of programmes and emergencies at HelpAge India, told IPS. “The real issue is of longevity. Families are not able to cope financially with the health demands of their elderly loved ones, since the government does not provide subsidies or tax exemptions for care of the elderly,” he said. According to data compiled by HelpAge India, the country’s largest voluntary organisation working in the service of economically disadvantaged elderly people, there were just 484 old age homes in 2010, serving a population of about 24,500 people spread across 15 metro and non-metro areas. Meanwhile, a 2009 survey indicated that there were 1279 such homes, serving a population of 44,765 people, each with an average capacity of 35 residents. Each of these homes had a substantial waiting list. Data collected by the NGO also indicates that more and more children are migrating abroad in search of better opportunities, leaving their old folks behind. In addition, young people are increasingly establishing their homes further away from their original communities, resulting in a steady rise of old people living alone. The plight of the elderly is even worse in the villages, where such facilities are practically non-existent. “Their plight is worsened by the fact that 70 percent of them toil in the unorganised sector”, which includes un-contracted farm labourers, small and landless farmers, domestic workers, textile industry employees, workers in brick kilns, carpenters, fisherfolk, vegetable vendors, barbers, tailors and rickshaw pullers among many other occupations. Though the elderly account for a significant chunk of the country’s population, they have no voice in policymaking, lamented Aabha Chaudhary, founder of Anugraha, a daycare centre for senior citizens established in east Delhi in 2005. In 2010, Anugraha became the country’s first regional and resource training centre (RRTC) on ageing under the ministry of social justice and empowerment. Chaudhary told IPS the government has yet to act upon a 2007 legislation that makes it mandatory for states to care for elders. “The ‘Maintenance and Protection of Senior Citizens and Parents Act’ of 2007 contains a clause that (requires) state governments to have one old age home in each district of the country, but this has not happened,” she stressed. HelpAge India is now lobbying the government to establish more old age homes right down to the village level. “We have submitted a proposal to the government for inclusion in the 12th Five-Year Plan for the welfare of elderly, especially the destitute poor among the elderly, as most old age homes with appropriate facilities are in the exclusive domain of private goods and only a few (operate) on the charity-based model,” Datta told IPS. “We have suggested a three-tier model with a 200-bed home at the state level, another at the district level and finally low-cost homes at the village level,” he added. For the tiny minority that can afford them, homes like Panchavati are model facilities, designed to eliminate the stigma attached to ageing in a fast-paced economy. Panchavati’s founder, Neelam Mohan, claims it is a “home away from home with the traditional joint family setting, where residents have the freedom to decide their own recipes, be involved in the functioning of the home, dress up for festivals and call friends and family over for visits whenever they like”. The former businesswoman converted her four-storey factory into a personalised home, comprised of 38 living spaces for couples as well as individuals, each with its own bedroom and bathroom and with libraries, lounges and open spaces on each floor. The rents are unavoidably stiff due to astronomical land prices in India’s biggest cities, a problem compounded by the government’s refusal to allow tax exemptions for retirement homes. Agreeing that much needs to be done to alleviate the plight of the elderly, especially those in dire straits, Neelam told IPS that Panchvati regularly facilitates training programmes and medical camps for the poor. “With assistance from HelpAge India, we provide in-house physiotherapy free of cost to the entire colony and we are engaged in talks with the Delhi government about setting up more old age homes in the city,” she said. Personal Home for middle class senior citizen of our county. star type or near to that ) on monthly basis in advance . the same premises on payment..